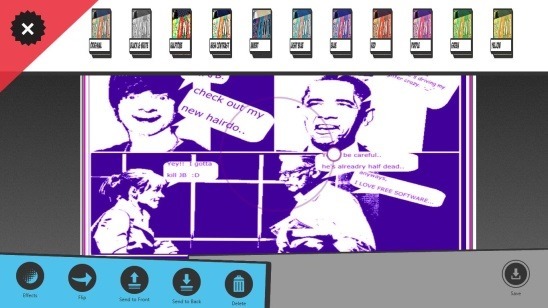 Comic Director is a free Windows 8 comic maker app that lets you create your own comic strips using photos and videos, and apply various cool comic effects to them. You can add multiple images and videos on a page and add different cliparts (such as fake hair, mustache, hat, action figures, etc.) and dialog clouds on it. Or if you are more into creating your own art piece, then you can use the various available brushes to create free hand drawings. Apart from that, you can add effects to the images, like Black and White, Halftone, high contrast etc. After creating the final comic page, you can share it with your Facebook friends or publish/save it in the app’s cloud. With this free Windows 8 comic maker app, you can create some really funny and interesting comic strips of your own, and your friends. The app is pretty handy in terms of overall usage and is a great medium to kill some time. 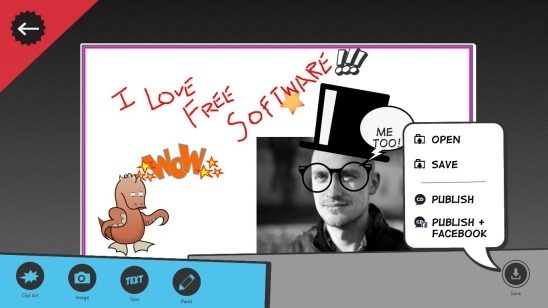 You can get this free Windows 8 comic maker app under the Social category in Windows Store. Or simply use the Windows Search Charm (Win + Q) to search for the app. Comic Director is good app to explore your creativity in terms of comic making and then share it with the world. The idea behind the app is interesting, and it absolutely does what it promises. The UI looks pretty cool, and the scaled up effect when you take a mouse over a comic page in the Home Screen is quite noticeable. The Home Screen of this free comic maker app is very simple, and it contains a button to create comic, some icons to view comic pages that you have created so far, and few more buttons for popular, spotlight, favorites, and recent comic pages. Creating comic strips within the app is very easy, as the buttons are self explanatory. You can right away start creating comic by clicking on the Create A New Comic Button on Home Screen. Clicking that takes you to a new screen where you will be asked to choose from the available default frames. There are 5 different types of frames, and you can choose any one. 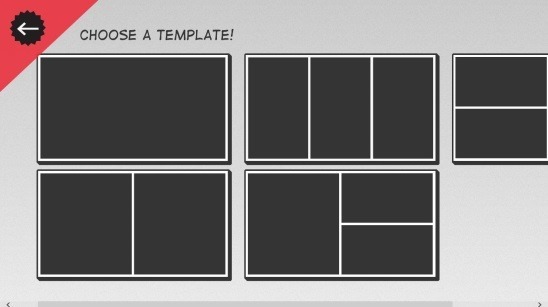 Once you click on the requisite frame, you’ll get a blank comic page having frame that you selected and the buttons that you can use to create comic page. If you don’t see these buttons then simply make a right click, and you’ll get these buttons on a flyout at the bottom side of the screen. Now you can start adding the contents by clicking on the respective buttons in the bottom flyout. The good things about this free comic maker app is that, it supports a very powerful set of features and tools to modify the comic contents. Scaling, moving, rotating the contents of the page is very smooth, and it doesn’t get stuck anywhere. It’s totally functional with no freezing or crashing. The other good thing about this free comic maker app is you can apply different cool effectsto the photos and videos with a single mouse click. Like I said earlier, once you are done with creating the comic, you can publish it in Comic Director’s Cloud, so that other users can view and like your comic. You can also view the other user’s comics from the Home Screen and like their art. There’s no need to login to the app for doing all the aforementioned activities. But in order to share the comic on Facebook, you have to login with your Facebook credentials within the app. You can do that by pressing Win + I combo, and then clicking on “Connect Facebook”. Pretty good app to create comics. Different frames to choose from. 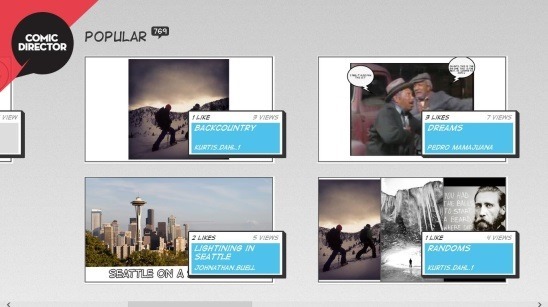 Can add multiple images and videos on a comic strip. Add dialog clouds, clip arts on the comic strip. Supports multiple filters for photo and videos alike. Publish on Comic Director cloud and share on Facebook. View other app users’ comics and like them. 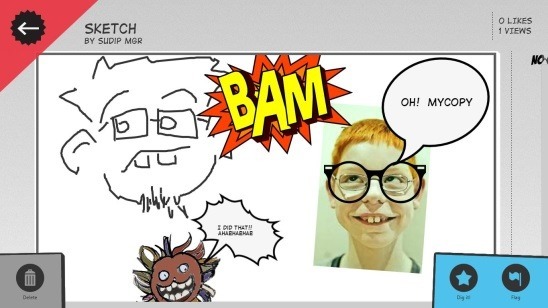 As a Windows 8 comic maker app, Comic Director is one good free app. Creating comic pages in the app is fun. You can make funny meme of your friends, and share it on Facebook. The biggest plus point of the app is it’s very easy, quick, simple, and has a good looking UI. It is hands down a great way to share your creativity with the world.